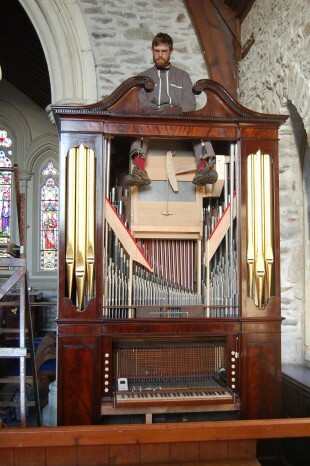 Jennifer Bate is playing the opening recital on the restored William Allen organ at St Peter Pilning Gloucestershire on Saturday, April 30 at 7.30pm. Tickets £20, available by calling 01454 632670. Here is a picture of Guillaume Zellner sitting triumphantly on the nag’s head swell box, waiting for the new urn which Nick Hagen made to sit between the two halves of the broken pediment.